Alona Rodeh, Rachid (Safe & Sound), 2015, HD single channel video projection on reflective fabric, color, sound, 3 minutes, 2 seconds. For her solo show “Safe and Sound (Evolutions),” Alona Rodeh explores the irony that assaultive artificial light and reflective clothing are assets both in club culture and in a more municipal context, such as the uniforms and equipment of police, firefighters, and construction workers. In her large-scale MDF sculptures, photographs, video and sound installation, a catalogue, and a limited-edition reflective drawstring bag, all displayed here, she probes how light and the engineered fabric can represent both personal expressions of rebellion and institutionalized methods of maintaining order. The relationship between club culture and surveillance is represented best in her video installation Safe and Sound (Rachid) (all works 2015), which is paired with Safe and Sound (Sound), the latter an audio piece by Rachid Mara. 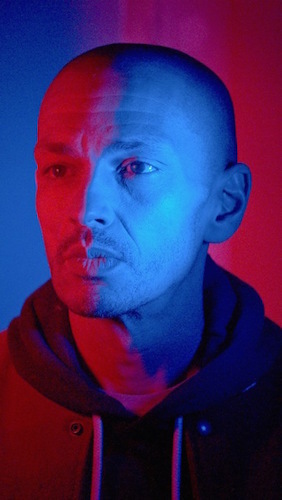 An alarm evolves into dancehall music while a three-minute video portrait of an expressionless, weathered, middle-aged man with a shaved head and unshaven face is projected on Scotchlite fabric. As Mara’s music builds to intensity, red, white, and blue lights pulse on the fabric—a type usually used in protective gear for firefighters or other safety workers—creating a hypnotic, 3-D effect. This, coupled with the man’s slightly menacing stare, makes his face intimidating, as if he were either a direct threat on the street or a stranger in a club. His face’s projection on the material also evokes objects seen through flames—the features grow hazy and quiver with the music and lights’ momentum. Blurring lines between extreme danger and subcultures striving for oblivion, Rodeh compels viewers to question how much they prioritize security over thrills, or to what extent they would trade comfort for excitement.